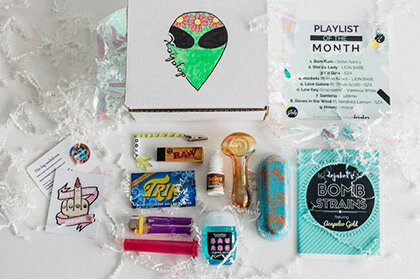 Dojabox is another excellent weed subscription box brought to you by Cratejoy. 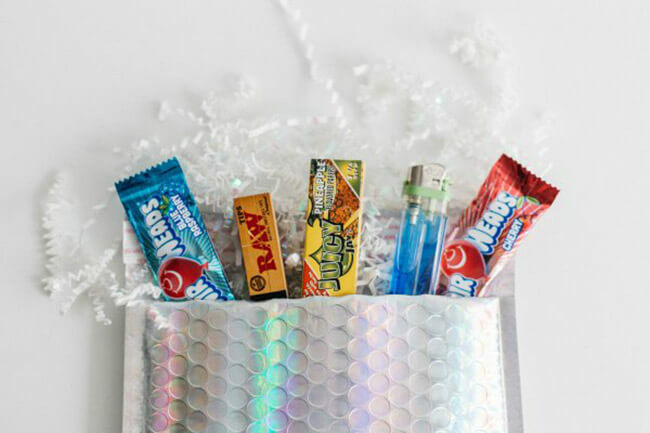 Unlike LitPact, this box is designed for smokers, particularly girls, who simply want an easy way to get their hands on all the essentials, plus a couple of extra surprise items to look forward to. The boxes are not customizable but instead feature all the best products handpicked by the Dojabox experts. 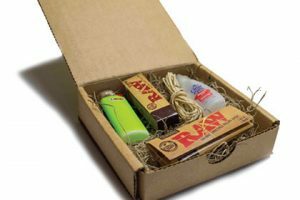 The boxes contain smoking essentials, such as lighters, rolling papers, hemp wraps, and rolling mats, as well as Doja treats and gorgeous glass pieces. You also get the playlist of the month, Mary-Jane recipes, and extra mystery items. You can choose from 3 subscription types: the Needzbag, the Beta, and the Alpha box. The Needzbag brings you the basics, including a pack of rolling papers, filter tips, and a lighter, plus the playlist of the month. The price starts at just $5 per month. The Beta box features the items included in the Needzbag, the main piece worth $10+, and awesome smoking accessories. You can get your Beta box for only $15 per month. The Alpha box differs from the Beta box in that its main piece is worth at least $30. The price starts at $30 per month. With all the boxes, you can choose between simple and discreet packaging and flashy, metallic or holographic packaging. 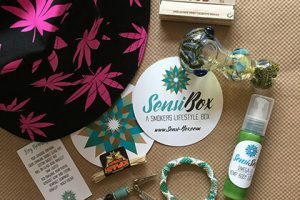 Be sure to follow Dojabox on Instagram, participate in the regular giveaways, and get the coolest products free of charge. Our ratings are the result of an objective and independent evaluation of Dojabox, generating the final rating that reflects the overall quality of the product. Ratings may change as the service changes. Dojabox user rating based on 1 user reviews. There’s no Dojabox coupons or discounts right now.